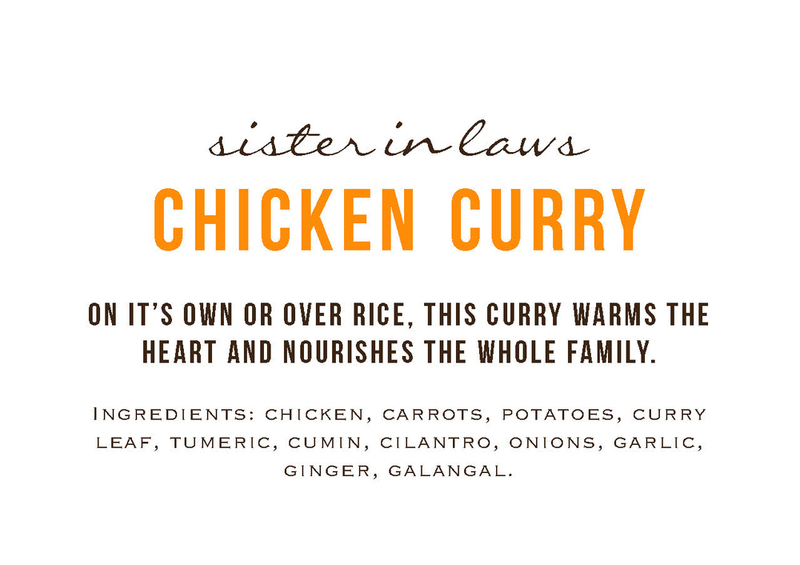 My sister-in-law Lien taught me how to make this curry from scratch. It's a family favorite. The curry is a weekly dinner staple. My kids go crazy for it. It's very mild, so it's up to you to add hot spices. There are two versions, a chicken curry stew and a vegan curry stew. Both are so comforting and hearty. The secret is in the base. Galangal is sometimes hard to find, but it's at Whole Foods if you are looking for an easy sourcing. It's sweet smell is flowerlike and a significant part of the flavor of the curry. Related to ginger, this root is good for digestion and blood circulation. Lemongrass is also sometimes hard to find, but it is also available at Whole Foods. Trim off the end and smash the end to break up the tough bulb. Then cut the stalk small enough to fit in the pot and big enough to retrieve it at the end of the cooking process. Fresh curry leaves are really hard to find. There are actually only two places I can find them in the East Bay, Ranch 99 and Berkeley Bowl. I'm surprised that it isn't in more places. If you can't get fresh then try to find it dried and use twice as much. In a stock pot sweat the onions in a bit of oil with the lid on, stirring occasionally to keep the onions from burning. Add the garlic, ginger, and lemongrass. Keep the lid on, checking every now and then, for 20 minutes. Make a spice sack with cheesecloth. Put the galangal, curry leaf, and bay leaf in the spice sack and toss it in the stock pot. Combine the ground spices - garam marsala, paprika, and turmeric. Toast the cumin and coriander separately in a frying pan, and grind in the spice grinder. Combine all the ground spices and add to the stock pot. Add the tomatoes and water and simmer for 1.5 hours. Remove the lemongrass, spice sack and about 2/3 of the ginger. Puree the saucy mixture with the miso paste, cilantro, and brown sugar in batches and mix with the remaining sauce. Keep blending and adjusting the seasoning to the consistency and spiciness desired. There are many brands of shrimp paste. I use this one. Hold your nose! It's so pungent! But it is crucial to making the curry more umami. Prepare the chicken. Rinse, trim, and dice the meat into 1"-1.5" chunks. Marinate the chicken with garlic powder, salt, corn starch for at least 30 minutes. Marinating all night is even better. Peel carrots and potatoes and toss with a light coat of oil and salt. Roast at 400F in the oven for 20 minutes. There may be some color on the veggies and they may be a little undercooked. That is ok. Don't toss them in yet. In a stock pot, add some oil and add the shrimp paste to saute for 10-15 seconds (it's so stinky you wouldn't want to do it much longer). Add the curry base and stir. Bring the combination to a boil. Add the chicken and vegetables and simmer for 10 minutes or until the chicken is cooked through. By the way, you don't have to use all these vegetables. I often used 5 veggies and the tofu in the quantities listed. If you cook all of these vegetables you may need more curry base. In a stock pot bring the curry base to a boil. Add the roasted vegetables and cook for at least 15 minutes to let the flavors marry.